Lansing has a de-facto embassy in downtown Sarasota, Florida: it is a bar and restaurant called Clasico on the corner of Main and Palm Streets. “This is one of the most iconic corners in town. It’s a privilege to be on such an important corner and do business of any kind,” said Raffaele Perna, the Lansing native who is managing partner of “Clasico,” which he describes as an American bistro. Perna, who owns the Okemos Golf Range, moved to the scenic, snazzy West Florida city in 1999, and plenty of hometown people have found him since. Perna said it has been important for him to reach out and be a part of the Sarasota community. As a result he has admirers there too, including VisitSarasota.com’s Britney Guertin. Perna admitted he is a people person, but said it is Sarasota he finds charming. In fact, Elite Airlines just announced non-stop service from Traverse City to Sarasota, and Delta has flights from Michigan into Sarasota and nearby Tampa; not to mention those who simply drive down I-75. A brand new innovative, stylish Embassy Suites Hotel just opened nearby and Clasico, like Rick’s in the film “Casablanca,” carries an air of local importance and sophisticated excitement. The building began as the Hotel Sarasota in 1927 and then spent decades as “Charlie’s Newsstand.” A regular customer whispered to me that the dirty books were in the back where two titillating pieces of art now hang in homage over the classic, mosaic subway tiled-floor. 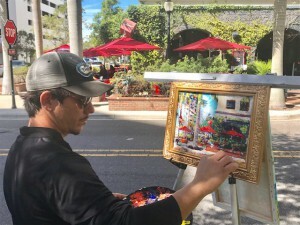 Other active vintage paintings of Sarasota – some of which came from Cuban street artist Lazaro Morera, often seen painting on the opposite corner – are displayed throughout. It’s the kind of place where a first date might be taking place at a corner table while a business deal is discussed at the bar. Two locals might be sipping mimosas street-side with their dogs while tourists stop for a bite before boarding the Le Barge tourist boat for a dolphin watching or sunset cruise. Guertin told me on Saturday nights a younger crowd takes over with dancing, too. “The magic of success is three things: good food, good service, and fair prices. A restaurant might be able to get away with two of those, but Clasico strives for all three. The typical consumer is educated. Just be nice to people and its amazing what happens,” said Perna, who plans to attend Lansing Catholic’s upcoming 40-year reunion. Maybe they should hold it in Sarasota at Clasico?